The night was freezing cold and we had added all the extra blankets to our quilt. There was never any heating in houses here, from what we had seen. We left Grootfontein around 10am. We did not have too far to go, and it was all tarmac. I had booked a camping spot at a lodge by the edge of river Kovango. 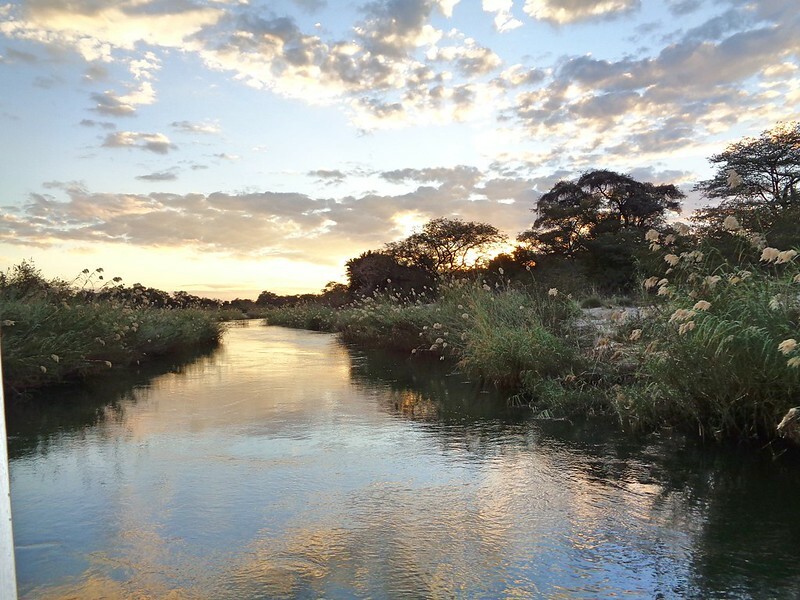 The river is the border between Namibia and Angola. After the debacle with Onguma lodge, I was rather keen to ensure a spot. I booked 2 nights there as the following campsite I had in mind was full until then. I had also ensure a booking there for few days alter. I was starting to be rather organized! After all, it was now full swing holiday season in Europe and could not presume it would be easy to find a camping spot. The only problem on the road was the cold. It was always sunny with big blue sky, but, that morning in particular, it was freezing. I put all my layers on and even like that I suffered with the cold. 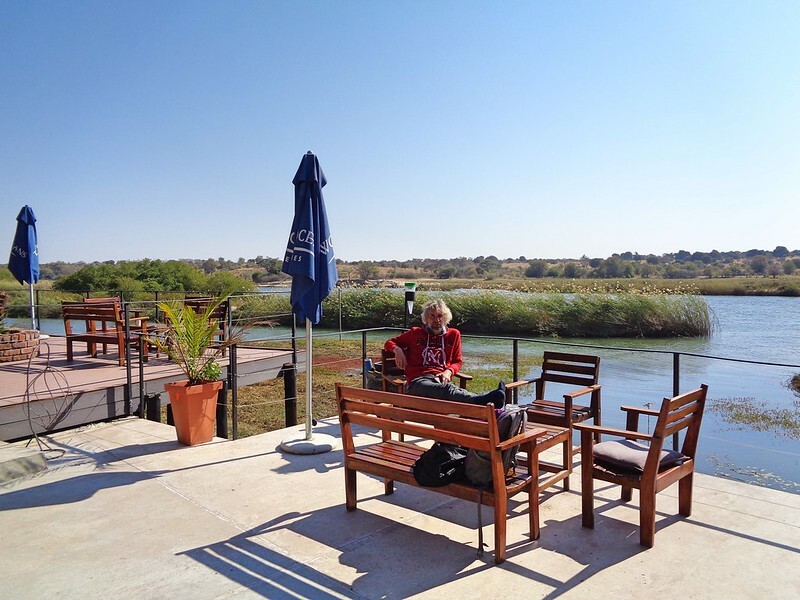 Eventually, by early afternoon, we arrived at Rundu. On the way we passed many traditional villages, with round huts and a round wood fence made of standing sticks side by side. There were lots of cows, donkeys and goats grazing by the side of the road. Davidprej, mbanzi and Dirt Road Cowboy like this. By mid day, as we passed all those traditional villages, kids, still in their school uniform, got all excited to see our bikes and waved or ran toward us. To start with, I waved back, but I worried that some kids could get too excited and run too close to the bikes, causing an accident. So I decided not to wave and ignore them instead. In Central Asia, some bikers started the trend of doing a High Five to kids, while riding. As a result, groups of kids now run practically in front of the bikes, even when riding fast. That made me very nervous over there. The first bike (usually Alistair) would avoid the kids, but by the time I arrived, the kids were all over the road, trying to force me to stop and high five them with my right hand! I hope Namibia will not turn that way. If a biker has an accident because of kids doing this, and a local kid gets even slightly bruised, it could end up badly for the biker. After a stop for fuel, we followed the GPS to the lodge. The way was via a sort of street with yet more deep sand for a bit of a mile. And with heavy traffic! At some point I started digging my back wheel in deep sand, but I eventually managed to get myself off the hole. Davidprej, forgorin, mbanzi and 1 other person like this. The grounds of the lodge were very pleasant. As usual for lodges, our camping spot had its own private small shower/ toilet block. The assistant showed us a site that had a concrete table and benches, after I asked for this, as we carry no chairs. This makes a big difference for me, as sitting in the cold ground is not great, and hurt my knees! After pitching the tent, we went for a wander. They had the usual facilities, a curio shop with carved things and stuff to sell, a bar, a restaurant, a large wood terrace over the river, chalets for the high paying guests, overlooking also the river, and a very large room with 2 big TVs. So we could watch the football. The night was very cold, even sleeping with layers. Our sleeping bags are goose down and usually very warm. We bought them in Buenos Aires, back in 2007, during our motorcycle year around South America. My bike had been stolen and with it all the camping gear. We replaced the sleeping mats and sleeping bags in Buenos Aires. But even the goose down was not enough to keep us warm! We were told it was snowing in the Cape, and the freezing wind was blowing from there! On the other side of the river: Angola. The next day we lazed around and got to know our neighbours in the campsite next to us. Three couples from South Africa on big 4×4 cars with roof tents and all the luxuries they can carry. Davidprej, forgorin, mbanzi and 2 others like this. The couple who inspired us to go to Africa rode on two CRF250L for 3 years around the world and covered 130,000 kms (about 80,000 miles). Those little bikes are tough as nail, simple to repair and keep going, not much that can go wrong with them! That encouraged me thanks a lot :) Actually before the trip I am considering to make some changes on seat to make it more comfortable. I could be missed that in your story but have you done any changes or modification on your seats before the journey? 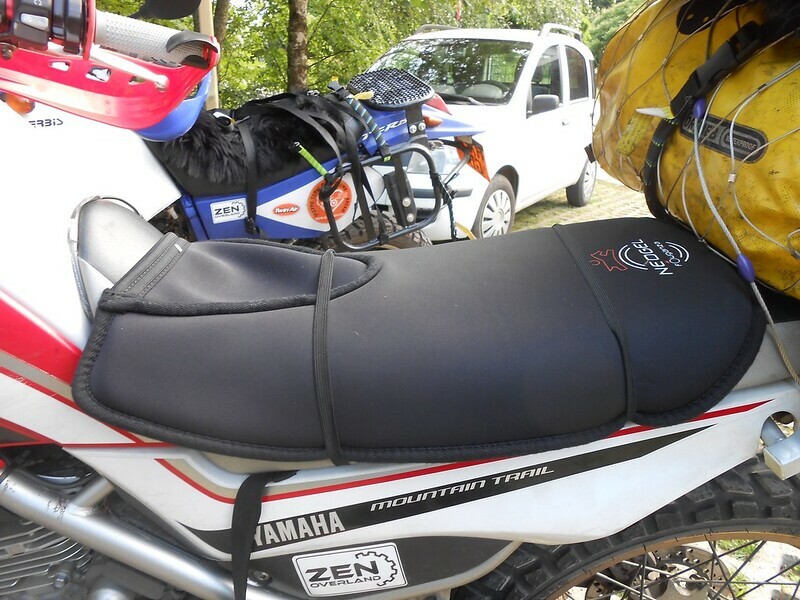 Hi Debak, for both bikes we simply bought cheap thick gel seats from a horse riding shop. They are usually designed to fit under the saddle. They are considerably cheaper than specific Motorbike stuff. I then bough about 6m of black elastic (from a clothes making shop) and put 2 around each seat, this is enough to stabilise the gel seat. On top of that we use sheepskins (they also get under the elastic so they don't move). One elastic at the front around the saddle, and one at the back. I have been using this method for few years now and it is perfect for me. The gel seats and sheepskins can also be used around camp (as seats, pillows, to protect inflatable mattresses from punctures etc... ) , so very convenient. Davidprej, Debak and joenuclear like this. We packed up very early. The night was still freezing cold. 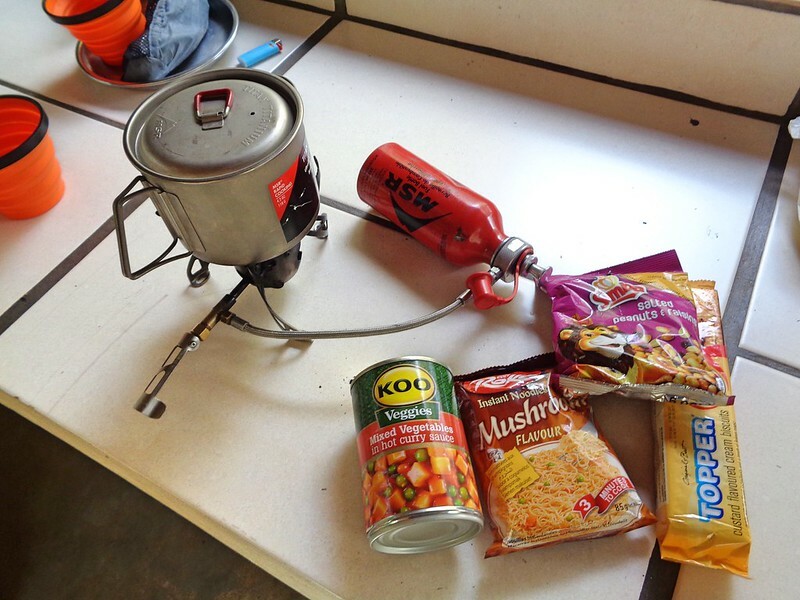 We stopped at the local supermarket for some supplies to last the 3 days we planned to spend in Shametu lodge, at the start of the cAprivi strip. Washed down with some excellent South African wine! Lodges are usually in the middle of nowhere. They don’t have a shop, or if they do, they don’t stock much. Lodge’s guests are in full board, and campers usually bring everything with them in their massive cars and trailers. South Africans travel in style! Those trailers have a fully integrated kitchen and fridge as well! At the car park of the supermarket, as we got ready to go, a woman and an old guy came to tell us to watch for a white car. They warned us they might try to follow us. As usual there were lots of people hanging around, or sitting in their cars. We thanked the couple and went. I kept an eye on my mirrors but did see anyone following us, which was a relief! forgorin, Davidprej, mbanzi and 2 others like this. The road followed the river Kovango, which is the border between Angola and Namibia. We passed many traditional villages, built with wooden huts and thatched roofs, with a round fence around them. As usual there were lots of cows and donkeys and goats roaming freely around. We finally arrived at Divundu by early afternoon. We bought fuel in the village and followed the GPS to the lodge. We saw lots of tourists in big 4×4 with the usual tent in the roof set up. The place was busy. It was close to the border with Botswana and on the way to Zambia. We found the turn off to the lodge. Once again, there was about a mile of deep sand. I made a mistake and quickly dropped the bike! I really don’t enjoy riding in deep sand. Sometimes I get it and skip over it using speed, and sometimes I just can’t do it! It is as much skill as confidence. It is a very big leap of faith, to stand on the foot pegs and open the throttle and accelerate over a long section of sand. Sometimes, I can do it, and sometimes, I chicken out! The lodge was lovely with great grounds. Our camping spot was shaded and enormous. It had a large kitchen area, under a thatched roof, with a big worktop and a big aluminium kitchen sink. Then another wood building was the toilet and shower room. The place was dark inside, the light bulb very weak, but it was fine. I asked the manager at the desk if we could borrow a couple of chairs or some benches to sit. She kindly got some staff to bring us a couple of camping chairs. In the evening we cooked our usual tin of vegs with a bag of noodles and spent the evening lounging in the various sofas and areas. The thatched roof of the main building had an owl and it 2 or 3 little chicks nesting in the ceiling. They used the big wide beams to nest there. As night fell, the mother owl would fly out through the big windows and hunt and bring back food for its chicks. They made quite a noise when they were hungry those little chicks. The owner explained that despite the mess they could cause (i.e. pooing on the floor of what was the big main lounge) it was worth having these owls there. They eat mice, which means there is less risk of snakes around, as snakes are also after mice. forgorin, Davidprej, mbanzi and 3 others like this. Thank you for the kind description, I will keep that recipe in my mind for sure :) Keep going! photo of the gel seat on the bike. It is extremely comfortable. td63, Davidprej, sages and 3 others like this. Yes, it looks well fitted. We booked a river cruise for the afternoon. 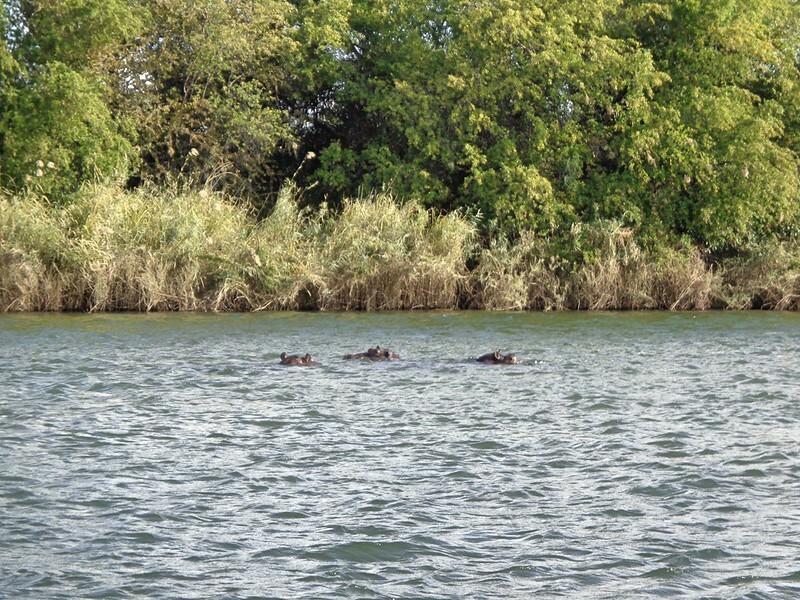 We saw hippos and crocs and lots of birds. We also saw the Pupa falls. They were more like rapids than waterfalls. Hippos out of the water as it seems the water was too cold for them. Spot the baby one! I took the opportunity, with the massive kitchen and big sink, to make a big wash, including my motorcycle suit. The weather was still fairly cool and surprisingly cloudy. We had not had any clouds since we left South Africa! forgorin, StinkyCheese, Davidprej and 2 others like this. With the WiFi working occasionally, near the reception desk, I did some research for the next leg of our trip. 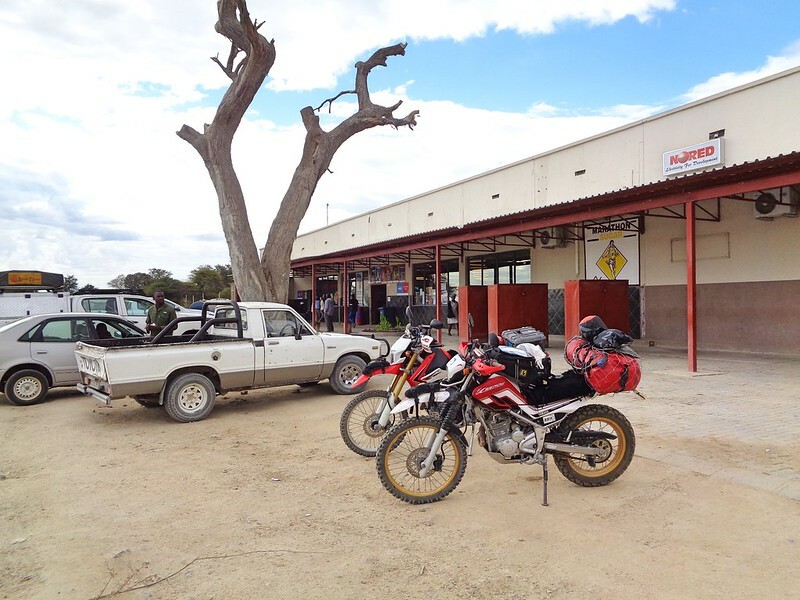 I found a couple of blogs detailing the border crossing between Zambia and Namibia. Money (local currency) is always a problem when crossing borders. Can we pay fees and costs with USD? Or do we need local currency? Is there an ATM machine at the border? Or do we need to deal with dodgy moneychangers? Beyond the border, can we pay stuff with a credit card or where is the nearest ATM machine? All that has to be planned a bit in advance. Well, Like to plan it if I can! I need to know how long we can go with cash, USD, fuel etc… In the past we have been left in a bit of a pickle because of that. I remember when crossing from Peru to Bolivia, back in 2007, we only had USD left once in Bolivia. We stopped in Tiahuanaco to visit the ruins. There was nowhere to change our USD and we could not pay with them for accommodation or anything. Eventually a woman changed us 10 USD which was enough for accommodation. I can't remember what we did to visit the ruins. I think we probably paid with USD! Then rode to La Paz where we are able to get local cash. WE also had that problem entering Peru as we took a 'shortcut' from Ecuador and need din the arse end of nowhere! So, these days, I like to plan when I can! Anyway, according to some blogs, there was a bank and an ATM machine, at the border, on the Zambian side, so we did not need to use moneychanger touts. I also looked at the itinerary across Zambia, where distance between fuel stations might be a problem, through the Great East Road. 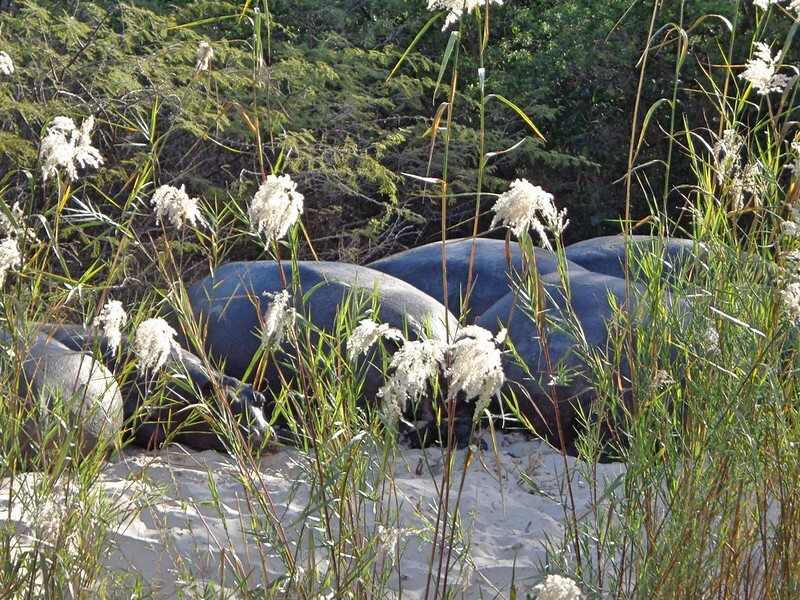 I investigated further Mozambique. Outside of the north East, which was considered dangerous (some “crazy” people had beheaded 10 people in the northern coastal region few weeks earlier), the country was considered ok. I read the travel advice from the US government website, which confirmed this. The on going sort of civil war between the 2 warring factions in Mozambique had stopped following a truce the year before. So, with the exception of a small region, Mozambique could be safe to cross. 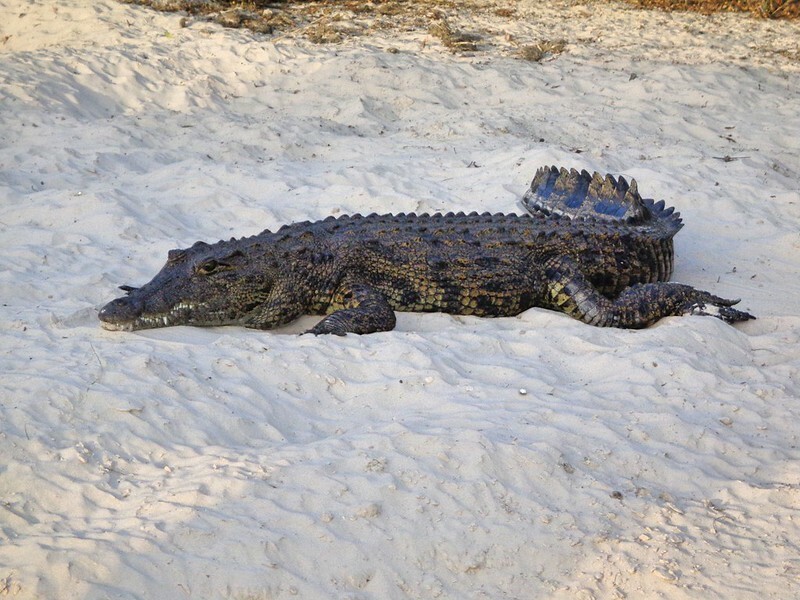 I was keeping a close eye on Mozambique news, as we would need to make a decision about our itinerary across Mozambique soon enough. Davidprej, joenuclear, jays100 and 2 others like this. It was time to leave Shametu lodge. The main building was like a Harry Potter movie with its 3 large owls living inside, nesting on the beams. At night, the mum would go hunting while the 2 young ones would constantly screech, asking for food, while looking at us below, turning their heard in funny ways, as only owls can do. Unfortunately we do not carry the sort of cameras that could take long shots in the dark. They were very cute. We left early. The road across the Caprivi Strip was long, straight and boring. We did not see any wildlife, despite crossing a national park with lots of elephants, lions and all that. The vegetation was kind of semi tropical with lots of bushes, trees and tall grass, so it would be hard to spot anything. Still, when we stopped half way, in the middle of nowhere, for a quick pee, I put Alistair on lions watch! I was told there were many lions and elephants there, so don’t laugh! The ride was tiring as we had constant headwind. Eventually, we arrived at Katima Mulilo and found the guesthouse we had selected online. We even had a booking! We were the only guests. Although the next day for breakfast, there were two men there, who sounded like they spoke Russian or some Slavic language. forgorin, Davidprej, joenuclear and 3 others like this. The guesthouse owner spoke with us of our plan to cross into Zambia. He warned us that the road, on the Zambian side, was in very a bad state and suggested to ride south and go via Botswana to Livingstone. In term of distance, it would be about the same, but we were not keen on crossing two borders on the same day and deal with all the taxes, fees and other stuff to pay twice and in two other currencies. Eventually, after looking at the map we decided to stick to our initial plan. After all, we had the perfect bikes for bad roads! We had dinner in the guesthouse. It was a set menu, beef and lots of rice, beans and some thick carrot soup that was to be used as sauce for the rice (I think?). Then we went to our chalet. The guesthouse had several little chalets, small but nice. They even had functioning WiFi! Yay! As usual I felt a bit nervous about the border crossing, not knowing what to expect! forgorin, Davidprej, squadraquota and 4 others like this. I was sad to leave Namibia. We spent 6 weeks exploring a little of this vast and very lightly populated country. There was so much more to discover. Kaokoland, in the North West is the most remote and wildest part of Namibia. We took the decision not to go there on our own. Without satellite phone, in parts where you could be alone and not see anyone for days or weeks, we felt it was too remote and risky to get there. The main reason was really to do with the wildlife. We have been to very remote parts, in Mongolia for example, Bolivia or even Russia. But even far away from everywhere, there was often the odd person coming out of nowhere, on a horseback, truck or walking, and most importantly, there were no risks of bumping into angry elephants or hungry lions and hyenas! It is easy to travel on a motorbike across the world, even when being as clueless and carefree as we are. I hope all my Ride Reports demonstrate that! However, facing big wild animals was a step too far for us. So we chickened out. Kaokoland is a part of Namibia I would like to explore; probably with a guide or with a sturdy 4x4 and lots of water, food and a roof tent! Namibia is an absolutely stunning and friendly country that totally bowled me over. I will have to go back. South Africans are so lucky to have it in their “backyard”! After breakfast, which was included, we left Happy Forest guesthouse and went to buy fuel. Then we rode to the nearby border post. Its as time to leave Namibia and get into our next country. Leaving Namibia was fairly fast and efficient. No touts in the compound. We got our passport stamped out, then Custom signed out our carnets, for the bikes. Then we rode to the Zambian side. All the offices were in the same building. We parked the bikes, surrounded by touts running along our bikes until we parked, all talking at the same time, trying to convince us to change money. However, based on my research, we went directly to the bank in the compound. I changed all our remaining Namibian rands into Zambian Kwachas (ZK). Meanwhile, Alistair got some cash from the ATM machine. Then we went to the offices. We had to pay 50$ each (in US dollars) for our single entry visa. Then we were sent to buy our insurance for the bikes (about 45 US$ each, but we paid in ZK). Then we moved to the carbon tax office for about 7 US$ each. Then we were directed to the road tax and toll window to pay 10 US$ each. By then we had forked out a lot of money! On the plus side, the officials were friendly and smiley. It makes a big difference compared with border crossings in Russia or Central Asia fro example. After that we were told we could go… only to be stopped just before the exit, to pay some additional local tax (3 dollars in ZK). After that we were really allowed to leave the border and enter Zambia! forgorin, Davidprej, mbanzi and 1 other person like this. The first 40kms were fine with good tarmac. Then things went bad, but not as bad as we expected. For a long section the potholes had been filed with a mix of stones and sand. After that we had massive potholes. They were very large and very deep. With our agile and light motorbikes we managed to slalom and avoid the worst without any trouble. Eventually we made it to Livingstone and found the guesthouse we had booked the day before. Livingstone is not as big and touristic as on the Zimbabwe side with Victoria Falls. The guesthouse was simple, the building rundown, within walking distance of the town centre and supermarket, down a sandy gravelly road. We decided to stay only two nights. We had been to Victoria Falls many years ago and stayed there few days, on the Zimbabwe side. 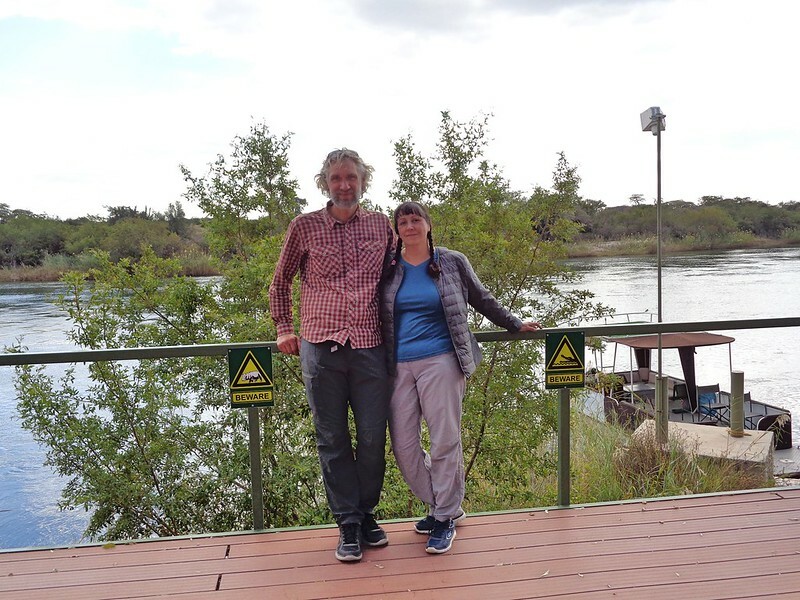 We had done all the touristic stuff that all tourists do: the bungee jump off the bridge, the white water rafting, the 3 days canoeing down the Zambezi river, the helicopter ride over the falls…. We were not keen on doing anything like that again on this trip. We had a look in town and had dinner in a café near the supermarket. Alistair did not warm too much to Livingstone. It was rather different from Namibian towns, with their orderly architecture and clean streets. Livingstone was a far cry from those. Zambia got independent from the UK in 1974. For about 20 years, Zambia went through a lot of trouble, economic mismanagement, corruption of the One Party ruler, the usual story. In the late 90s it was probably one of the poorest countries in Africa. Democratisation finally happened in the 90s, slowly. We visited Zimbabwe and a bit of Zambia, in 1998, in an organised backpacking tour, and back then, the country was still incredibly poor with dreadful roads. The economy eventually stabilised in the last 20 years, exports increased and GDP followed up. Unemployment is still a problem (as is corruption, bureaucracy and the size of the public sector) but the government is taking education seriously and the vast majority of children are attending school. And major roads were fine most of the time). Although most are probably being built buy the Chinese form what I gather. We saw schools everywhere, even in the most rural areas. Education is the most significant tool to get out of poverty, so this is a tremendous investment. University graduates are not looking at leaving Zambia anymore, from few conversations I had. It seems opportunities for careers in Zambia are attractive enough to keep graduates in, and with that the country will benefit and grow further. Poverty is still an issue, but things are starting to happen. There is still a long way to go but I felt a great optimism emanating from the locals. forgorin, Davidprej, squadraquota and 1 other person like this. We went in search of an ATM that would accept our MasterCard. Not an easy task in Zambia, but we eventually found a bank that would take it. Every time we go travelling, we try to open a bank account with a bank that would not charge for withdrawing money abroad. Every trip we change, as this free scheme never seems to last. This time was no exception. Alistair got a new bank account and got the debit card, but it was MasterCard instead of visa. In Zambia they don’t seem to like much MasterCard! For British readers, we used Starling Bank. It works very well via a phone App and the exchange rate is superb, almost interbank level, with no extra charges. We eventually, after visiting many local banks in the Main Street, found one that would accept our card and would not charge a fortune for the pleasure! Of course we could also use our debits Visa cards but our banks both charge a lot. In the afternoon I lazed around, sitting in one of the various harm chairs dotted around the shaded inside garden, and read my book. The place was fine, our room minuscule and our shower gave us an electric shock when touching the taps. If we were dry it was ok, but once I stepped into the shower and got wet, Jeez! Nasty. I had not had a shower giving electric shocks since Bolivia! We did some research to find accommodation in Lusaka. We usually avoid capital cities, but we needed tyres! No way round it and we could only find them in Lusaka, or few months later in South Africa. We decided try to change them in Lusaka if we could. In nay case, we had no choice, as all the roads go to Lusaka and there was no way to avoid it on our way East. 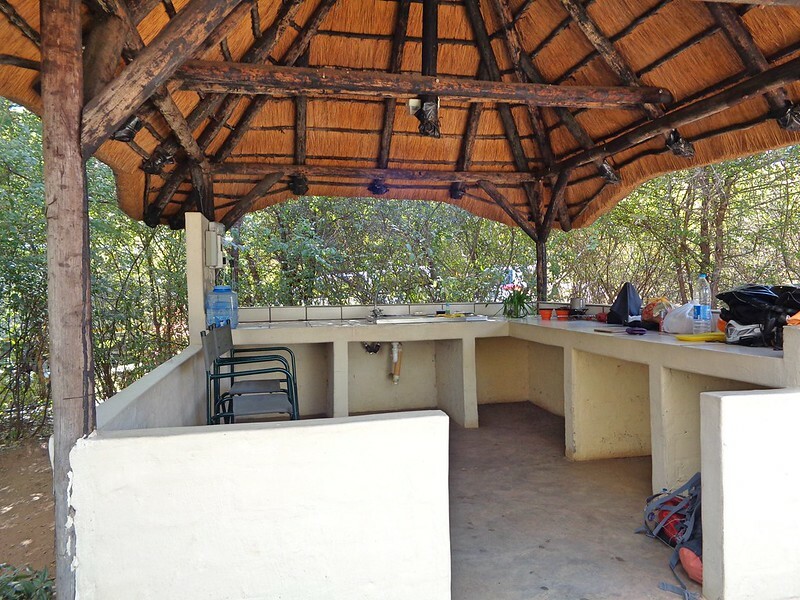 After going through all the terrible and expensive backpackers places, Alistair found a nice AirBnB flat in Lusaka. It even had secured parking for the bikes. So we booked it. forgorin, Davidprej, joenuclear and 1 other person like this. We left Livingstone early as we had planned a long ride. We were not aiming to get to Lusaka on the same day, as it was too far and we did not know the state of the road. We decided to stop at the last big town before the capital city. We had constant headwind, which was very tiring, so it was a long day. Our bikes have no fairing so we had it full on. We finally got to our destination for the night. 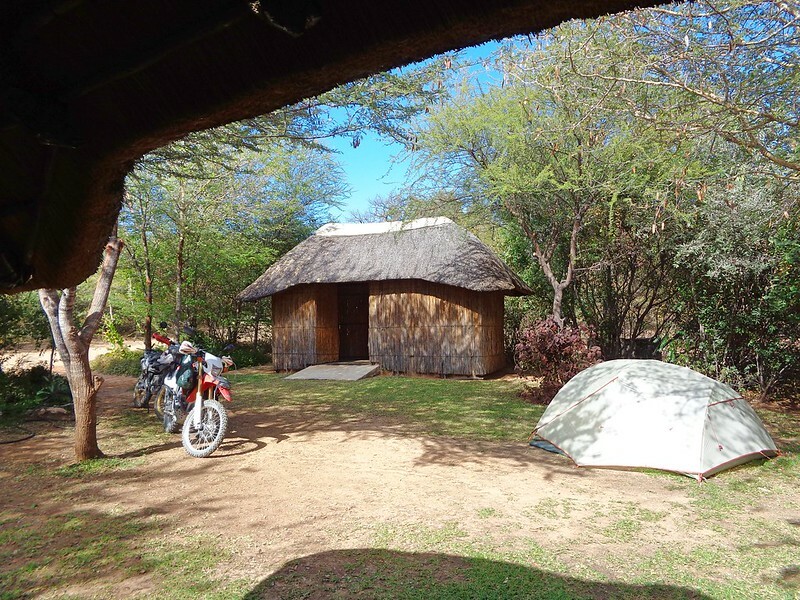 The cheap guesthouse we had found in iOverlander was ‘interesting’. The room we visited was an absolute dump. No way would I sleep in that bed and those sheets! The horrendous bathroom had a massive plastic tub in the middle, full of water, between the shower and toilet. When I asked if there was no water, the lady showing us round mumbled something. When I tested a tap in the sink, there was no water. I then asked if they had WiFi, not expecting they would. The woman looked puzzled. I added, thinking she did not understand my French accent: “you know, WiFi, for Internet?”. She looked at me and said: “what is it, a dish?”. Hmmm…. Seeing the state of the bedroom we decided to inspect the other choices in town. After a bit of a run around (the second place we looked at was fully booked!) we eventually found a descent and clean guesthouse with large grounds. After a long day ride with lots of wind we were rather tired. We ate at the restaurant attached to the guesthouse. Choice was chicken, pork or beef. We took chicken! It was good.